SAD detected 185 square kilometers of deforestation in the Brazilian Amazon with a cloud cover of 38% over the territory. Fonseca, A., Martins, H., Souza Jr., C. & Veríssimo, A. 2014. 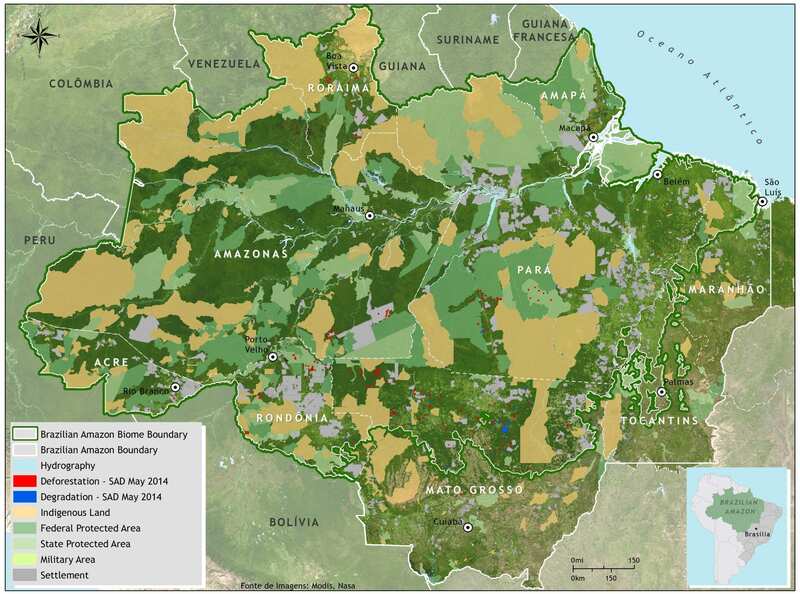 Forest Transparency for the Brazilian Amazon (may 2014) (p. 9). Belém: Imazon. In May 2014, SAD detected 185 square kilometers of deforestation in the Brazilian Amazon with a cloud cover of 38% over the territory. That represented a 119% increase in relation to May 2013 when deforestation totaled 84 square kilometers and cloud cover was at 46%. The deforestation accumulated during the period of August 2013 to May 2014, corresponding to the first nine ten months of the current deforestation calendar, totaled 846 square kilometers. There was a 49% reduction in accumulated deforestation in relation to the previous period (August 2012 to May 2013) when deforestation totaled 1,654 square kilometers. 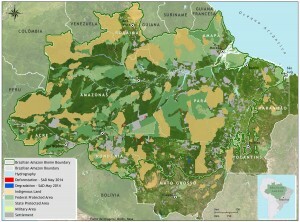 In May 2014, the majority (56%) of deforestation occurred in Mato Grosso, followed by Pará (21%), Rondônia (10%), Amazonas (8%), Roraima (8%) and Acre (1%). Degraded forests totaled 159 square kilometers in May 2014. In relation to May 2013, when forest degradation totaled 75 square kilometers, there was an increase of 113%. The great majority (94%) occurred in Mato Grosso, followed by Pará (5) and Rondônia (1%) and Roraima (1%). Forest degradation accumulated during the period of August 2013 to May 2014 totaled 566 square kilometers. There was a 56 % reduction in relation to the previous period (August 2012 to May 2013) when forest degradation totaled 1,293 square kilometers.